If you happen to be in the market for a new smartphone, or more accurately, a “phablet” type device, then you want to be perfectly sure that your resources are being invested in the right device. It’s relatively easy these days to be taken in by the hype that generally exists when a new device hits the market, but it’s extremely important to look behind the marketing spiel and get an accurate understanding of the real-world performance of your chosen handset. For those that are looking for a new toy, but are stuck on the fence, this YouTube video pits three of the market’s best phablets against one another in a speed test. What better way to showcase the capabilities of the Samsung Galaxy Note 5, the LG G4, and the new OnePlus 2 than by pitting them against one another in a PhoneBuff style “virtual obstacle course”? The purpose of any speed comparison test is to try and get an accurate representation of how the tested devices perform against one another when subjected to the same tests. In this particular “obstacle course” the first lap is all about raw processing power, with the second time around the track focusing on how well each device can perform multitasking actions. To provide an indication of processing power, the provided test is simple; invoke and access various menus within the device before launching Temple Run, exiting the game when loaded and invoking a second application. The test is designed to provide an indication of how quickly each tested device can launch a fairly processor intensive game, before exiting to the home screen and getting up and running with a new application. It’s immediately evident that Samsung’s Galaxy Note 5 is the clear winner with its Exynos 7420 octa-core internals and 4GB RAM. 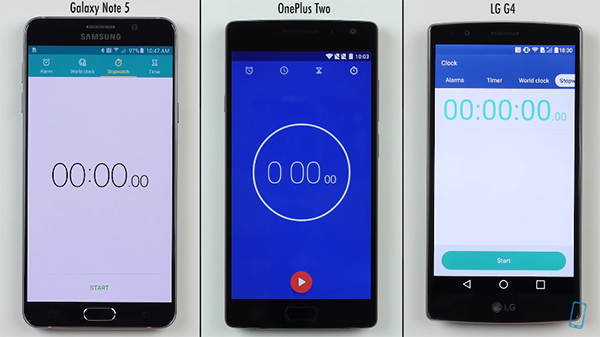 The OnePlus 2 will not be proud of its performance in this particular test. One of the most important aspects of smartphone usage is multitasking. The second part of the obstacle course shows that LG’s G4 performs the best out of these three devices. Despite having 4GB of RAM under the hood the Note 5 showed notable problems when trying to run several applications in the background. 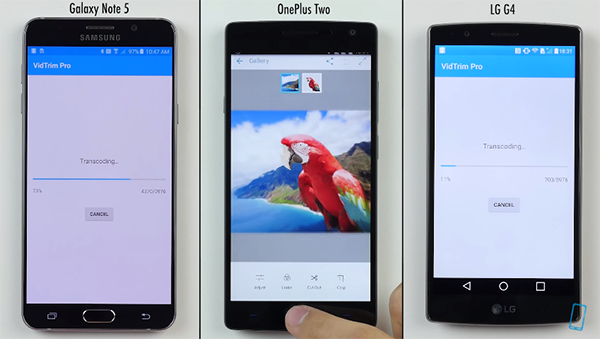 Once again, the OnePlus 2 doesn’t appear to be much of a competition for the Samsung and LG behemoths. At least not in these tests. Check out the video for yourself and tell us what you think.